Join in the Valentine Challenge fun! The goal is to get a total of 14,000 meters between February 09 and midnight on Valentine's Day, February 14. Note: BikeErg meters are counted as half when applied to the challenge. Indoor rower, SkiErg and BikeErg meters only (no on water/on snow meters please). You can combine meters from each machine to reach 14,000 meters. Download your choice of Concept2-designed Valentine's Day cards to send to your friends and loved ones! 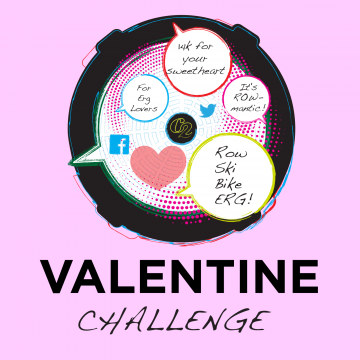 Be included on the Valentine's Challenge Honor Board: The Erg Lover's Board. You can even edit your online logbook profile to include a special Valentine's Day "Message for others to see." If you make the Erg Lover's Board, fellow rowers/skiers will be able to see your creative message.